I am so sorry that I have been neglecting this blog lately. Let me explain what has been going on. In my course of blog surfing I came across a blog that was doing a Pink Saturday Post each Saturday. I decided to join in and also decide to start a separate blog just for those posting. Well low and behold I have been spending all my time on my new blog themanyshadesofpink.blogspot.com. I got so involved that I started running contests each month. We just had a "DO YOU DARE" Contest which you had to dye, tint or paint your hair pink to enter. It was so much fun that now that it has ended ...I came up with another pink contest. If your curious as to what this one is all about, you'll have to come over sometime and check it out. Cut off for entering is Wednesday, Jan 7th., so hurry on over and get your entries in. As for this blog......I do have so much more also to share with yous and promise I will do more posting real soon. Maybe I will have to come up with some kind of contest having to do with the old and tattered treasures in our lives. Until then..thanks for stopping by, and Happy New years to you all. I found this lovely photo above while surfing the Internet and absolutely fell in love with it. So simple yet elegant at the same time with its unconventional thanksgiving colors. Now here is a refreshing way to hang onto the warmer weather with its delightful pastel colors. So shabby chic yet still carrying on the traditional feel. 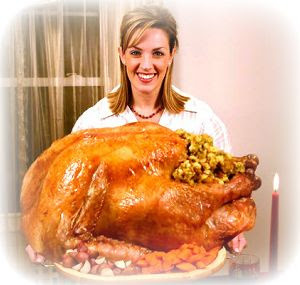 Just add that golden brown turkey and your set to go. 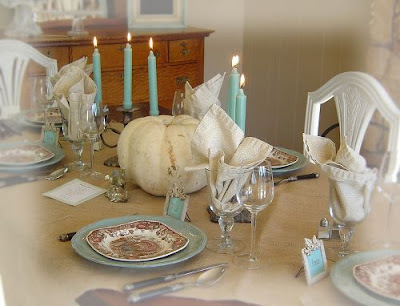 Since I have fallen so for the colors aqua and robins egg blue and love how she used them for Thanksgiving, I think I'll try a Christmas vignette using the the same shades. These are the colors of my business and will work just fine in my newly created office. Because I have so many grandchildren I will stick with the traditional colors in the rest of the house for them, but a small little area of my own sounds nice. I'll post the photo soon. Hello everyone, so sorry it's been so long since my last post. This has been a very busy and hectic month and it's not over yet.I didn't want you to think I jumped ship so I am for now just adding a small posting to let you know I'm still alive and painting. The above photo is one of the finished pieces from one of many tattered treasure that I was so lucky to find. I'm really quit happy with the way this lovely chair turned out. What a difference a day and a little paint can make. 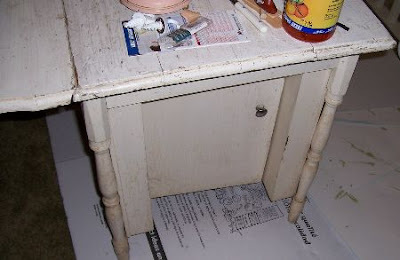 The photo below is the way I found her, so cold and grungy all alone in a corner at the goodwill store just begging me to take her home and give her a makeover. Again, I'm so sorry my post is so short but I really need to get through this month first and I'll be back full force again. Hoping you all have been able to find some tattered treasures of your own that you'll be able to give your own special touch to and enjoy for a long time to come. If not, keep searching for I'm sure you'll find something calling your name. In the mean time as always "Happy Hunting"
As you can see I've now gone crazy, all of these pieces came from the same yard sale and lucky me they already have a base coat of white paint on them. That was a very lucky day that day. One sunny Sunday afternoon a few month ago, my husband and I headed off to an antique shop in Lee, Ma. but sadly it was closed. I was quit disappointed for I really needed to get my shabby chic, old and tattered junkie high on that day. As we proceeded to head back, my husband then suggested we take the back route home. Normally I don't like the back routes, I prefer to drive on the main highways at a faster speed. Boy was I ever glad I listened to him. Driving along the back roads all the sudden I could see what almost appeared to be large white clouds, but they were not in the sky, but on the ground ahead of me. As we got a little closer, my heart stopped....oh my gosh, oh my gosh, I screamed. My husband started yelling calm down, calm down...pay attention to the road not whats on the side. I pulled the car to a quick stop and bolted from the car, I think it was still moving. 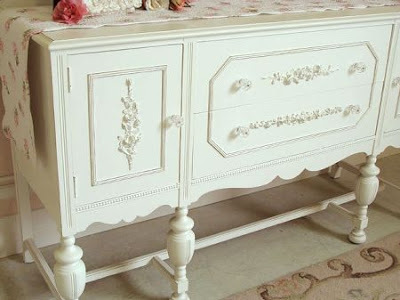 Well the white clouds were tons of old and tattered pieces of white painted furniture. White, white and white everywhere. Never, ever will I resist the opportunity to take the back route again. I first spotted two white cane round back chairs. "How much for those chairs?" I shouted out. The guy says $20.00 for the both. The words "SOLD" couldn't come out of mouth fast enough. I proceeded to ask the price of different pieces and continued to say "SOLD". Every thing was about ten or twenty dollars. The last piece was a hallway coat rack. I thought well maybe this is going to be too high, but what the heck give it a try. As I once again asked and he said $10.00....I looked at him in such awe and said "what are you crazy?" He must of thought that my expression and saying what in such astonishment, that he was asking too much so he immediately said well how about $5.00. Oh my gosh I've died and gone to heaven. Here I thought he was asking too little to begin with and now he says $5.00. What was this man thinking. "Oh ya, I know what he was thinking, old and tattered junk, just get it out of here. His loss my gain. Could ones day get any better, I think not. I ended up with (2) night stands, (1) cabinet, (2) cane back chairs, (1) two piece corner desk unit, (1) very gorgeous display table, (1) hallway tree cabinet, (2) old plant stands, (2) long shelves, (1) old magazine rack and some odds and ends. Then to close the gate to heaven so no one else could have a chance to nab these treasures up...... this guy says "seeing your buying so much, I'll let you have it all for $50.00. Now I know I really had died and gone to heaven. My husband just sat in the car the whole time shaking his head. He did although occasionally peek his head out the window asking "Can I ask you just how do you think were going to get all this in the car and where in heaven are you going to put it all when you get home?" No way was I passing this up, even if I had to carry it home on my already broken back. I immediately once again was on the phone calling my son to come with his truck and rescue me, boy it's sure nice to have such a wonderful, helpful son with a truck (but at this point he's probably wishing he didn't own one). Well as always, there he was to help and within an hour the stuff was loaded up and ready for its new home.......my home. These pieces and others are now being done over and will be for sale on my site in the future. 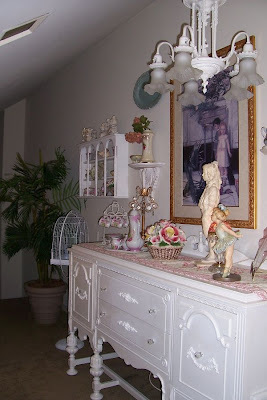 As I took a few minutes away from my painting every thing in sight white, I came across Periwinkle Vintage's Blog. Now it appears that I may have to try this out too. She says it's really easy to do, but I really think I might be getting my self in way over my head. I wonder what the top of my newly painted and (what I thought was a finished project), would look like with a mosaic top, hum.... maybe all in pink. Oh my Oh my...now I have to start looking for pink dishes. Does the love for shabby chic decor ever end? If you think you might like try your hand at doing some mosaic pieces then check out her work, she listed under "Some of my all time favorite bloggers" as Periwinkle Vintage. Well, you never know maybe down the road you"ll see another before and after photo of what was once an old and tattered buffet brought back to life not once, but twice. Pretty lucky buffet wouldn't you say? I think I just might give it a try, but right now I really should finish all my other unfinished pieces that I have been accumulating in the past few months. 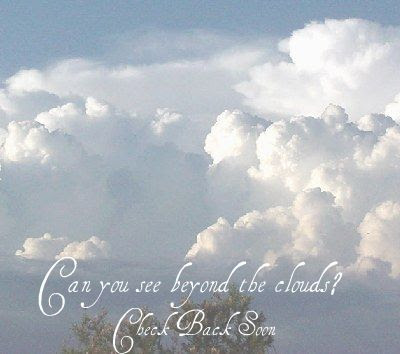 Check back again soon when I will share my glorious journey through the beautiful white clouds to heaven, the day I found a truck load of old and tattered treasures . You won't believe your eyes. After two coats each of Kilz primer, paint and topcoats its done. I just absolutely love it. I also changed the knobs and added some appliques which I think were the finishing touches. This newly painted buffet has also been added to my new shabby chic loft/office space along with the chair and desk I did previously. 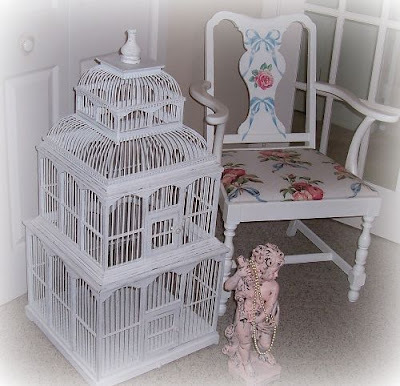 I am actually get ahead of my self for I even painted the shelve on the wall and the old bird cage white too (both from yard sales), it's like I now can't stop. Now with these tattered treasures all newly painted I'm on my way. I can now start decorating the room. I plan to do a plate collage and more. It's all coming together just as I hoped. I hope you stop back again soon to see the finished room filled with many tattered, old and worn treasures that were all found at yard sales. It's amazing what you can find out there exceptionally when you looking at what appears to be junk with a vision in mind. That's right, I just had to start looking for one of these and I found it. The photo below is my newest challenge and I am so hoping that I can create the same fresh look as the pic above. Keep in mind the one above is not my finished product.....just an inspirational photo. Many that I saw were in very good condition...too good to be painted over with white paint. 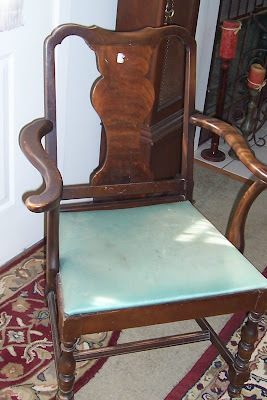 I continued my hunt for a tattered and worn piece that was just begging to be treated with tender care and of course one for very little money. Check back to see my finished treasure soon. Well I have now finished my first two pieces that sit in one little section of my new shabby chic space that I am creating for myself. They fit perfectly at the top of the loft where I can look down over my living area and even enjoy the view to my deck. The desk, I decided on a vanilla cream color and the chair is a wetland green. 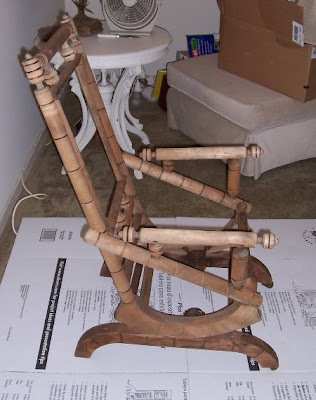 I also had my handy man son cut me two boards so that this chair with out a seat would be complete. I absolutely love it, it definitely is "Shabby Cottage Sweet." I am now well on my way and have already purchased a couple more old & tattered pieces. 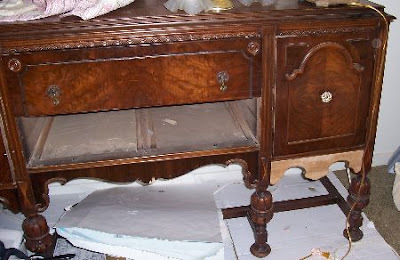 I saw in a magazine where they had taken a dark stained buffet and refinished it white with new knobs and adding some appliques. Well, guess what's next? What good is a desk without a chair one says...or even worse, one without a seat. After finding my little table-desk, of course it would need a chair. I found one at the Goodwill Store and just adored all the detailing. My of my! could this possibly work I asked my self. Well, why not give it a try, so for $10.00 off it went to it's new home. I had now found these two old and tattered pieces in the hopes of creating some of my first of many shabby chic treasures. At first I was going to paint it white like the desk, but then decided why not try out some of the other warm and inviting shades of this new style that has now consumed all my thoughts. After all this was a whole new venture for me. that I purchased and my thoughts behind it. 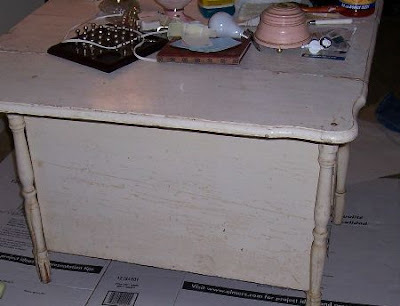 The very first was this old drop leaf dining table that was already a white ( a very dirty and worn white). I found it in a second hand shop and was immediately drawn to it, even in the shape it was. It was missing one of the drop leaf on one side, but had these adorable little cupboards on each side. I looked at it and looked at it, trying to vision what I might be able to do with it. It was at that point I decided that what I could do was to take over our loft area and change it into a shabby chic office space. I decided that I would take this treasure home with me and clean it up a little with some paint and use it as my desk there. Firsts things first though.....I had to tell my husband that I was claiming the loft area and that his little TV room was going. He really wasn't too upset for he does not use it that much any more. I proceed to call my ever so handy son "Mike" who has a truck to come and help me move every thing out of the room and to pick up my new found treasure (my old/new desk). He was quite happy to help out for he ended up with the TV, TV cabinet, two over stuffed recliners, tables and on and on. Now here stands my very first piece in a empty room, all tattered and dirty with four split legs. My husband looked at me like I was crazy......."What are you going to do with that piece of junk?" he asked in disbelieve. I told him I thought it was cute and he laughed saying "Should I call the men with the straight jacket?" To me it would be perfect once cleaned up and the the two side cupboards would be a added bonus for storage of office supplies. 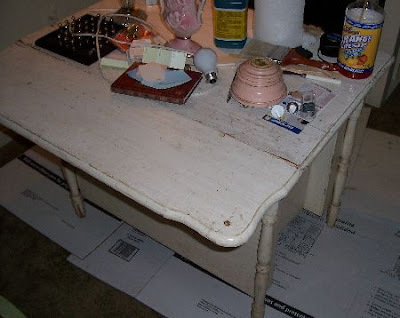 Mind you, I already have a beautiful large office in our finished basement, but this would give me a small room to work with and try out my skills at creating a shabby chic room. I have now finished this piece and will post some after shots in a day or so....so check back again to see my new first treasure ...my desk. 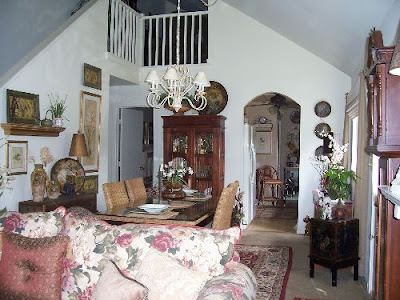 I am now on my way to creating what I hope to be a relaxing, wonderful space for myself filled with many things of my new love for "Shabby Chic Decor" from old and tattered items. Somewhere a long the road I was bitten by the shabby style of the old, tattered and worn brought back to life with a little tender care and a warm heart. I think it was one day I was surfing the Internet and came across some shabby chic websites. There was no stopping me now, now I was hooked and hooked bad, I couldn't get enough to look at at. I already had a Baby Website but had been contemplating opening another also. 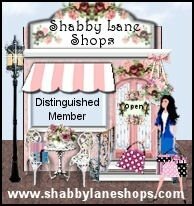 I then decided to combine them both under a new name "Shoppes on Boutique Drive" this way I could have more than one department and include some of the shabby chic, romantic, tattered vintage items that I was falling in love with. This gave me the desire to go out to antique shops, flea markets, tag sales and more. As I began to look at some of these pieces I found myself looking at them in a whole new way then I ever did before. I could now imagine them being used in different ways or painted a different color or even to be left as they were. Now all this old and tattered stuff was all the sudden brought to new life in my head and I couldn't stop there. I decided to buy a couple pieces of furniture to take home and see what I might be able to create out these treasures that I just found. I now was consumed with wanting to know all the ways that I might be able to transform these pieces. 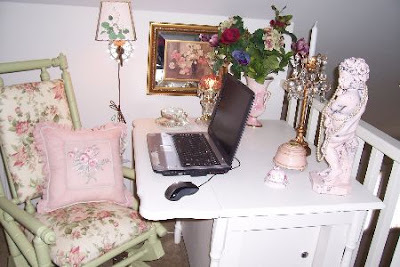 Again I spent hours researching the Internet for articles on different techniques for painting furniture and creating that shabby chic, romantic, vintage look. 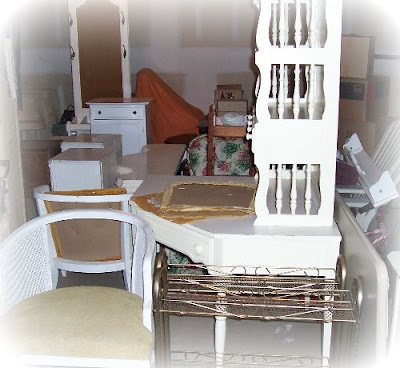 I now was on the look out for items for resale and furniture pieces to re-do. 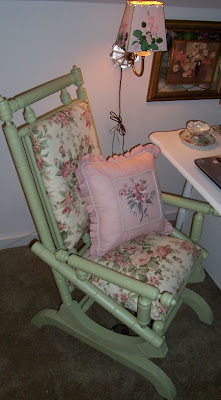 As I continue to post, I will show and tell of my journey to the shabby chic, romantic, vintage and tattered world. A lot has transpired since the day I became hooked and I will share it all with you in my next postings. Until then, happy treasure hunting to you all, and may your days be filled with the joys of life. 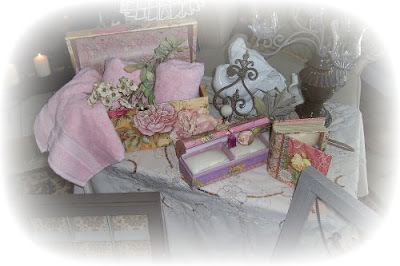 It's so nice to have you join me in my passion for shabby chic, romantic, vintage and all tattered things brought back to live with a little tender care and a warm heart! I'm new to blogging but have to start somewhere. 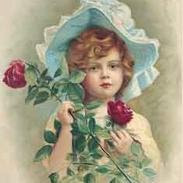 Hopefully before long my pages will be filled with exciting and enticing articles and photos for your viewing pleasure. We ask that you please do not copy or use any of our photos or reprint our writings without receiving our written permission first. I'm Baaaack!!! Plus Target Beauty 25%+ off!!! !